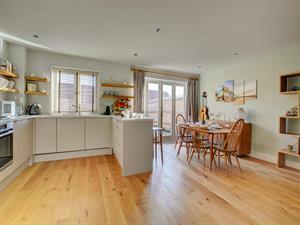 Graylings01263 715779work01603 870304fax Self-cateringA wonderful escape for four people with open living at the heart of this luxury holiday home. With comfy sofas and 'ercol' dining suite Graylings is both stylish and spacious, a contemporary style kitchen is well equipped for family dinners. There are two versatile double bedrooms, one king and twin beds offer flexible sleeping arrangements, the master being en-suite and a roomy family bathroom with shower. There is private parking for two cars however there is a great choice of local shops on your doorstep with butchers, bakers, boutique shops and restaurants, there is so much to do in the pretty village of Burnham Market, located three miles from the wonderful beach at Holkham. A wonderful escape for four people with open living at the heart of this luxury holiday home. With comfy sofas and 'ercol' dining suite Graylings is both stylish and spacious, a contemporary style kitchen is well equipped for family dinners. There are two versatile double bedrooms, one king and twin beds offer flexible sleeping arrangements, the master being en-suite and a roomy family bathroom with shower. There is private parking for two cars however there is a great choice of local shops on your doorstep with butchers, bakers, boutique shops and restaurants, there is so much to do in the pretty village of Burnham Market, located three miles from the wonderful beach at Holkham.